Tails are wagging for the latest edition of Traveling with Your Pet: The AAA PetBook®, just released. The annually updated guidebook contains all the information needed to plan a pet-friendly vacation, from hotel and park listings to pet preparations and safety tips. It also features scenic, smile-provoking photos of traveling pets — a reminder to capture the action from this year’s vacation for the next AAA PetBook Photo Contest sponsored by Best Western, now open for entries. Whether you are looking for affordable, comfortable hotels near your favorite recreation spots, or luxurious accommodations that extend the royal treatment for both you and your canine companion, you’ll find it in Traveling with Your Pet: The AAA PetBook. The book includes more than 13,000 pet-friendly, AAA Approved and Diamond Rated lodgings in the U.S. and Canada. Listings include fees, permitted pet sizes and conditions of stay for properties across every Diamond Rating level. For outdoor enthusiasts, the book lists more than 400 AAA Approved pet-friendly campgrounds. Readers will also find useful tips for preparing four-legged travelers for the road or air and handy information about pet etiquette, insurance and emergency animal clinics. This vacation, be sure to capture some photos of your pet enjoying safe travel. Each year, entries from the AAA PetBook Photo Contest are selected to appear on the back cover and spine of the next edition of The AAA PetBook. In addition to cover fame, the winners also receive cash, pet treats, copies of the book and a Best Western Travel Card usable worldwide. Entries must be received by Nov. 30, 2011. See inside The AAA PetBook for details, or access official contest rules, an entry form and the contest photo gallery at AAA.com/PetBook. 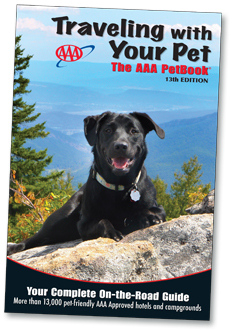 Traveling with Your Pet: The AAA PetBook, 13th edition, is available at many AAA and CAA offices, The Travel Store at EllenBarone.com (powered by Amazon) and online at bn.com and at fine bookstores. The cover price is $18.95 U.S.